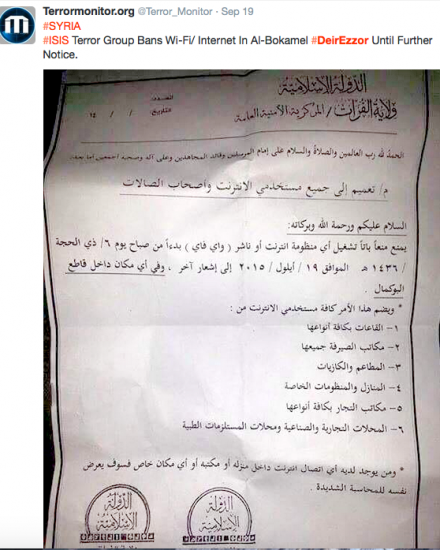 ISIS has imposed a citywide internet blockade in the city of al-Boukamal in the Syrian governorate of Deir Ezzor. The internet ban extends to all communal halls, offices, shops, banks, petrol stations and homes. “We are not allowed to use the internet anymore, not even in our houses,” a local activist told ABNA News on Saturday. A SalamaTech field researcher from Deir Ezzor observed that local residents are concerned about the permanency of the ban. “This ban is mainly meant to prevent media workers and human rights activists from reporting on the ongoing atrocities by the terrorist group against civilians in Deir Ezzor and its countryside,” a local activist told ARA News. While this may well be the case, the timing of the ban is likely significant. 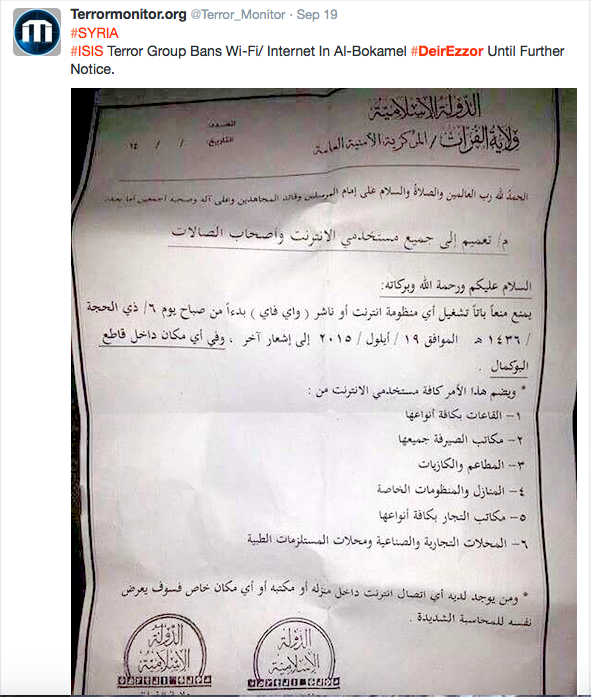 Earlier this summer, ISIS issued a similar edict across the governorates of Deir Ezzor and Raqqa. That ban obliged all satellite internet café owners to remove all WiFi signal boosters and privately-owned WiFi routers, register their businesses at the Islamic State Security Office, and register the identities of all internet users in their cafés. Last week’s al-Boukamal decree demonstrates ISIS’ continuing efforts to control the information environment, for likely military as well as public relations/stability reasons. A steady stream of reports provides evidence on ISIS’ ruthless crackdown on non-ISIS supporters. Last week, for example, the Syrian Observatory for Human Rights reported that a 22-year-old activist from Deir Ezzor was executed after being accused of “conspiring with apostates”. The young woman’s phone had been taken in a raid on her home two months ago. Inspection revealed evidence of communications on WhatsApp with her brother who is an ISIS dissident and militant, which prompted ISIS to detain and, eventually, execute her. News of her death circulated widely in social media feeds. Since the beginning of the revolution, the internet and social media have served as a political lifeline for non-violent activists and a platform to expose atrocities committed by Assad, other armed actors and, more recently, ISIS. For its part, ISIS has emerged as a highly sophisticated user of social media – to recruit, inspire and garner popular support. Its recent actions to ban and control the internet in Syria are certainly linked to enhancing its military security. But it is also driven by the need to ensure no images or messages leak out that counter its dominant narratives of military success, struggle for justice and deep popular support. According to Deir Ezzor is Being Slaughtered Silently, one of the many Syrian non-violent groups that are known to speak out against ISIS atrocities. See SalamaTech’s earlier bulletins on the November 2012 and January 2013 internet shutdowns by the Assad regime.